Who says, "You can't take it with you"? 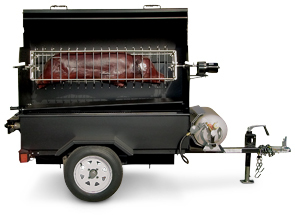 Now you can take these profit machine, pig roasters on the road for any grilling event. Belson's patented telescoping spit basket, is now nickel plated. The 56" x 15" basket telescopes from 15" to 5" and has meat-retaining prongs to hold meat firmly during roasting. The spit basket has the capacity to hold a whole pig or lamb up to 150 lbs. There's no lifting at arm's length; just roll the spit basket into the roller bearing sockets, lock and start roasting. Want to learn how to spit roast a pig? View our FREE Pig Roast Manual Online! 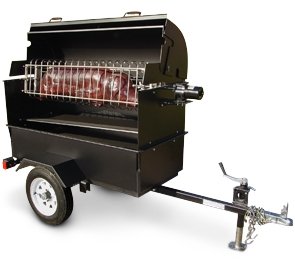 The Pig Roaster spit basket offers a highly efficient, low cost method of producing outstanding large quantities of delicious barbeque. The 110V-4 RPM motor that powers the rotisserie ensures consistent temperature and rotation speed. Many barbeque experts agree that rotisseries produce a better and more consistent flavor than flat grills. Every unit is easily accessible through the removable front panel. The welded drip pan quickly drains grease from the cabinet.